Post No.–: 1036; Dated 11th May 2014. 2) Bringing Soma herbs from the remotest Himalayan mountains to Vedic sages to perform Somayaga. 3)Bringing emeralds from the deeper valleys and hence emeralds is known as Garudaratna, favourite of Kubera, God of Wealth and Friend of Lord Shiva. Sumerian literature reflects these tasks in slightly different forms. It may be due to their migration from India in the remotest periods. Middle East history is very clear about their migration from remote areas. Egyptians also say that they migrated to that country. Hindus are the only ace in the world who never talk about any migration from any other part of the world. Sangam Tamil literature is also very open in saying that they belonged to a land between Venkatam (now in Andhra Pradesh, South India) and Kumari on the southern sea shore. Foreign scholars deliberately distorted this picture with vested interests. Sanskrit words such as Tiamath, Sumukhan,Azigi, Vizigi (snake gods) in Sumeria can be explained only through Vedic literature. 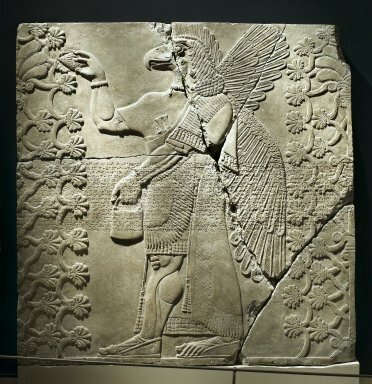 Picture of Eagle headed genie from Assyria 883 BCE. There are 60,000 lines on clay tablets in chaste Sumerian ‘emegir’ and another 60,000 lines in ‘emesal’. Emegir is like Sanskrit spoken by kings and higher strata of the society and emsal is like Prakrit spoken by women and lay men. In Sanskrit dramas Kings speak Sanskrit, jesters and women speak Prakrit. This is seen in Hindi and Tamil films even today. Those who are higher ups in the society use posh language and comedians and country women use colloquial language. The story of Garuda (eagle) and Amrita is in Hindu mythology and Sumerian civilization. My research shows that the entire human beings were divided into two groups at one time. 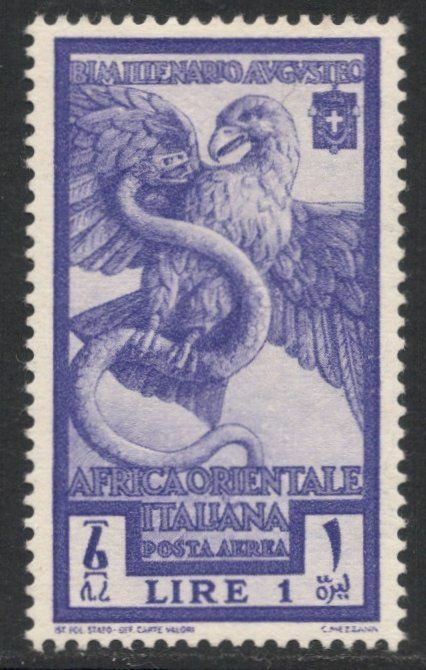 They were Eagle people and Snake (Nagas) people. We can see this division in Hindu, Egyptian, Mayan Civilizations and the Middle East. At one time Middle East was the melting pot where people of every race and culture came together. Rig Veda also has hymns praising eagle as Suparna, Syena etc. I give below two stories from Sumerian and Hindu scriptures. No one needs to explain the connection because it is self explanatory in the stories. Grant me the herb of birth. Tell me which is the herb of birth. Set aside my shame, set for me a name. Shamsh, to whom Etana’s libations and offerings of wild sheep had been agreeable, answered him: ‘Take to the road and reach mountain’. Now this mountain had recently been the scene of a drama enacted by an eagle and serpent. The two creatures lived side by side with their progeny. One day the eagle conceived the criminal design of eating the serpent’s little ones. He accomplished the heinous crime in spite of the wise remonstrance of one of his little ones, ‘young but very intelligent’, who put into him the fear of Shamash’s wrath. ‘Take to the road and reach mountain. I will keep you a buffalo. Open the interior and pierce his belly! Make your habitation in his belly. Birds of all kinds will descend from the sky. The eagle will descend with them. He will seize on the flesh. Cut off his wings, his pinions, his claws. Let him die there from hunger and thirst! And so it was done. Deceived by the serpent’s stratagem, the eagle fell into his power and was condemned to perish slowly in the ditch. When Etana had come to the mountain he found the eagle in the prison and , as Shamash had counselled him to do, he asked for the herb which would give him a son. The eagle promised to procure it for him as soon as he had regained his strength. For eight months Etana brought food until the eagle was at last able to fly again. He offered to carry Etana up to the very sky of Anu. Etana’s fear of heights however caused problems and the attempt ended in failure. Nevertheless back home in Kish, Etana had a dream about successfully reaching Ishtar’s realm, taken as a sign to make another attempt. This time the eagle secured him well and the pair reached the gate of heaven. Here the extant text (on clay tablets) breaks off, but it is probable that Etana did obtain the plant of birth, since further fragments and the Sumerian king list mentions a son named Balih. Some cylinder seals of the Akkadian period and an impression from one of the middle Assyrian period show a pastoral scene with a man riding on the back of a large flying bird, thought relate in some way to the legend of Etana, though the Akkadian seals are two to three hundred years earlier than the oldest texts of the story known. Page 109 of Dictionary of the Ancient Near East, the British Museum ,year 2000 . 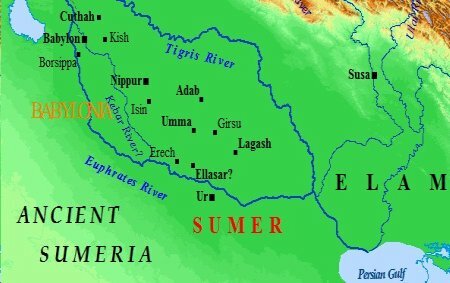 In some records Etana was the 12th king: In the Sumerian king list, the twelfth king of the city state Kish after the time of the Flood is described as a shepherd who ascended to heaven. The full story is recounted in mythological compositions of the old Babylonian period and later. Garuda means ‘the devourer’. 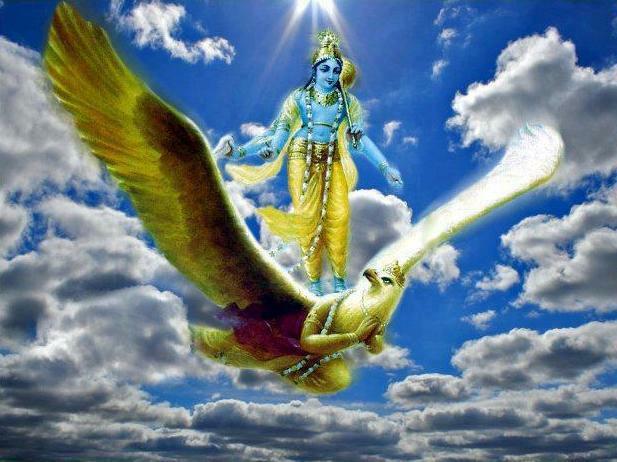 Garuda is the celestial bird which is the mount/Vahana of god Vishnu. 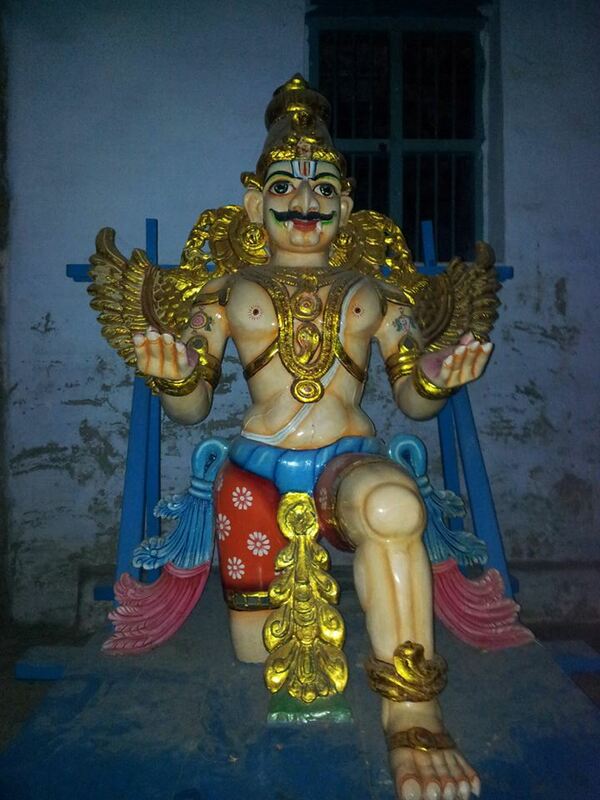 Garuda, often depicted as part human and part eagle, was the offspring of Kasyapa, one of the seven divine sages. Kashyapa married Vinata. Garuda was associated with fire and the sun. He was regarded as an incarnation of Agni. He was the enemy of the Nagas, the race of serpents. According to the mythology, Vinata was enslaved by his sister/co wife Kadru, the mother of all snakes. Kadru promised to release her if Garuda brought the elixir of life ‘Amrita’ from the heaven. Garuda stole it from the heaven in order to free his mother from Kadru. Indra discovered the theft and fought a fierce battle with Garuda. The Amrita was recovered partly, but Indra was worsted in the fight. One of his epithets is Amrtaharana. He placed the elixir of life on the sharp bladed grass Dharba and the snakes licked it splitting their tongues, which have been forked ever since. Vinata was released. In the Vedas Garuda is praised as Suparna and Syena. Eagle/ Garuda references: RV- I-80:2; 93-6; RV. III 43-7; IV 18-13, 26-4/7, 27-3/4; V-45-9; VI-20-6; VIIII-82-9; 100-8; IX 68-6, 77-2, 86-24, 87-6;X-11-4; 99-8;144-4/5. The guardians of Soma tried to attack eagle and it escaped, according to Rig Veda(RV). Gandharvas also linked with the Soma plant in many verses. Mandalas of Kasyapa, Angirases and Bhrgus have more verses on Soma than others. There are ten Mandalas(divisions) in the Rig Veda. The Rig Veda and Avesta (Yasna Ceremony) agree on many points regarding Soma (Haoma plant). 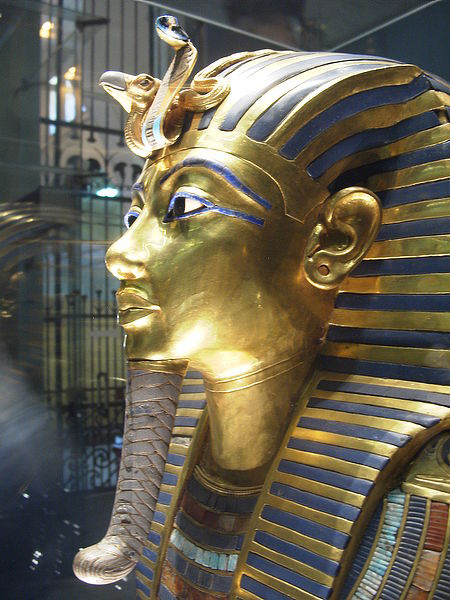 Tutankhamen mask with snake like Hindu God Shiva. 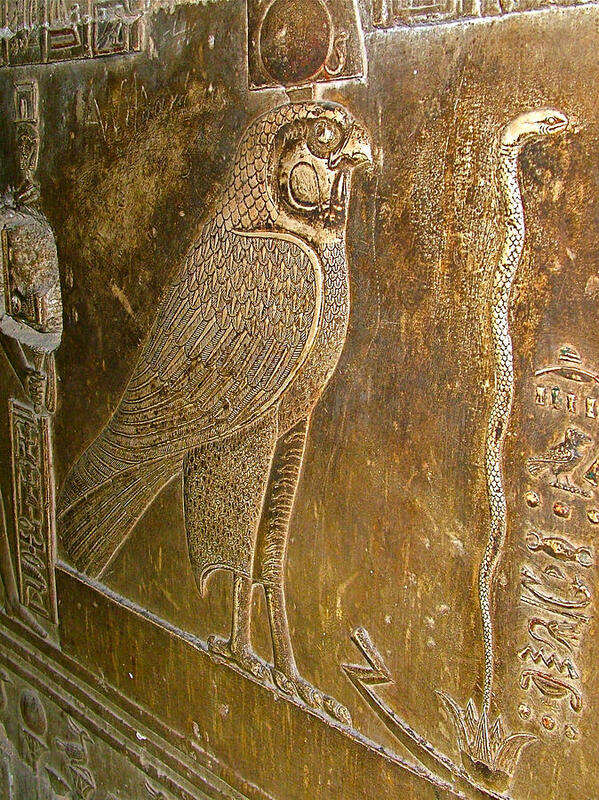 Although this was written two years ago, I stumble upon it now as I search for a connection between Garuda and the Falcon of Ancient Egyptian lore. There was a dream I had that was more a memory, in which I was participating in a ceremony where I bowed before a falcon statue because I was a descendant of the Falcon and it was necessary to acknowledge the gods before continuing onward. I will peruse you blog for more info, but wanted to say thank you for writing about what you know.